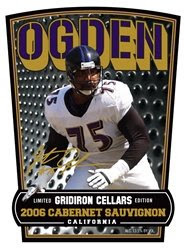 At first I thought Ogden had left the Ravens to become a producer of fine wines, then I realized the only thing he has to do with the product is his name and image on the label. Support the Jonathan Ogden Foundation for student athletes by buying his wine here. Except, of course, if you're in Maryland, cuz the direct shipment of alcoholic beverages from outside the state to consumers in Maryland is a felony. Gotta Stock Up on These! Guess What I Got in the Mail Last Night? The Only Thing I Can Say is "Yum"